Alex Randall, of Shoreline, is suing King county and the Sheriff's Office detective, Richard Rowe, who pulled him over and pointed a gun at him. 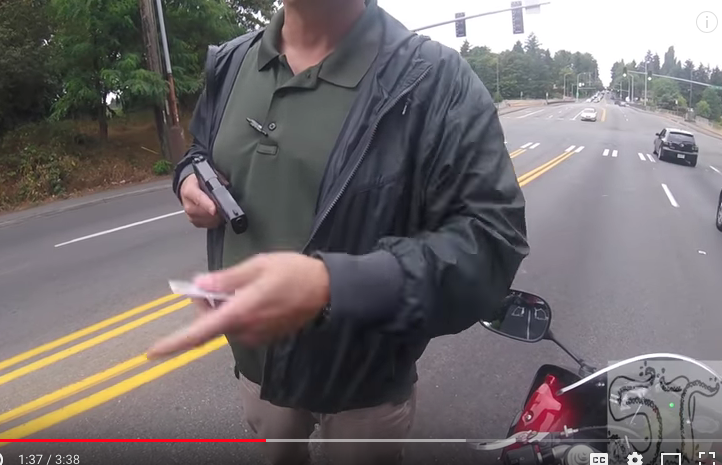 From an article in The Seattle Times, "The lawsuit alleges the King County detective used excessive force in dealing with the motorcyclist during a traffic stop, and that the county failed to train and supervise its officers adequately. It seeks unspecified monetary damages." Randall admitted that he was speeding and might have cut off Rowe's car. Rowe was in plain clothes and driving his own vehicle. He did not immediately identify himself as police. "A video of the encounter taken with Randall’s helmet camera showed Rowe pointing a gun at Randall, cursing and threatening to “dump” him if he moved his motorcycle." Then-sheriff John Urquhart stated that he planned to use the video to train officers. I hope this citizen wins his lawsuit. Since when is speeding a capital offense in King County? Law enforcement should be FOR us, not against.